MASHONALAND WEST, Zimbabwe-A narrow bumpy and dirty road snakes through maize and tobacco fields in a small village in Zimbabweâ€™s Mashonaland West province. The maize and tobacco crop were healthy as the area has received substantial rainfall since the onset of summer season late last year. But some fields were strikingly better than others, with more lush green maize crops. â€œThis farmer is practicing conservation farming,â€ Jeremiah Matiza, who is the manager for Carbon Green Africa in Hurungwe district said. â€œYou can see there is a lot mulch in the field, thatâ€™s what we are encouraging farmers to doâ€. Carbon Green Africa is spearheading the conservation farming project under a project named Kariba REDD+ which is running in four districts in Mashonaland West province namely Binga, Nyaminyami, Hurungwe and Mbire. REDD, an acronym for Reduced Emissions from Deforestation and Degradation, according to the United Nation is an effort to create financial value for the carbon stored in forests, offering incentives for developing countries to reduce emissions from forested lands and invest in low carbon paths to sustainable development. This is to be achieved with a focus on reducing deforestation and degradation of the forests through appropriate management. Since the inception of Kariba REDD+ in 2011, upto 1 200 Farmers have been trained per year by Carbon Green Africa on conservation farming and where necessary, material inputs have been provided. To date more than 6 000 farmers have benefited from the training programme. â€œConservation farming will wean farmers from the use of fertilizers and other chemicals,â€ Matiza said. And Nyamakate Primary School in the same area, managed to turn a barren ground which was used as a soccer pitch, into a thriving conservation nutritional garden with the support from Carbon Green Africa. â€œThis garden was once a soccer pitch, the ground was hard and barren but we turned the soil and used a lot humus for it to be a thriving garden as it is today,â€ Matiza said. 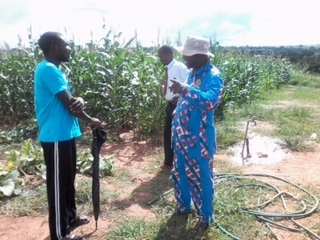 â€œThere are tomatoes, butternuts and maize and we are using the same garden as a nursery for various treesâ€. According to the Food and Agriculture Organization of the United Nations (FAO) an estimated 300 000 farmers in Zimbabwe have now adopted conservation agriculture. While only five percent of Zimbabweâ€™s maize-growing area is currently under conservation agriculture, those farmers who have adopted it have been able to harvest more from their small plots, averaging around two tonnes per hectare for maize, which is nearly triple what they produced under conventional agriculture, FAO noted . A traditional leader in Mashonaland West, Chief Chundu said revenue generated from the Nyamakate Primary School nutritional garden was benefiting the school. â€œItâ€™s a good project; children are learning at the same time the school is getting money out of the garden,â€ Chief Chundu said. Carbon Green Africa CEO, Charles Ndondo said the Kariba REDD+ Project maintains two Climate, Community and Biodiversity Standards Gold Level criteria which are the Climate Change Adaptation Benefits and Exceptional Biodiversity benefits. Gold Level criteria from the Community, Climate and Biodiversity Standard is awarded to projects that mitigate climate change, contribute to the sustainable development of local communities and biodiversity conservation. Covering over 785 000 hectares of vital forest ecosystem in Zimbabwe, and positively impacting the lives of up to 200 000 members of some of Zimbabwe’s poorest communities, the Kariba REDD + project is a community driven project, Ndondo said. â€œThe projectâ€™s activities provide substantial contributions to climate change adaptation through its activities in conservation farming and beekeeping,â€ Ndondo said. â€œConservation farming techniques are more drought-adapted than conventional agricultureâ€. But not everyone in the area is happy. A councilor for Ward 7 in Hurungwe, Jealous Matesanwa, told people gathered for a local traditional meeting at Nyamakate Secondary School that Carbon Green Africa was not doing enough to empower the communities in Hurungwe. Matesanwa, who as the councilor of the area sits in the council meetings where decisions pertaining to the Kariba REDD+ project are made, blamed Carbon Green Africa for making some unilateral decisions when running the project. Matesanwa raised the issue of inputs for conservation farming which he said Carbon Green Africa used to give farmers but withdrew the facility this season. â€œWe used to get maize seed for conservation farming but we are no longer getting it,â€ he said. But Ndondo said it was not fair for Matesanwa to blame his company for withdrawing the agricultural input scheme under conservation farming as such decisions were made at council level. â€œAt the council meeting it was agreed that we should use the resources available to train more farmers on CF (conservation farming) instead of giving the agricultural inputs,â€ Ndondo said. â€œWe donâ€™t decide but the people decide how to run the project. These are not our projects, they belong to the people,â€ Ndondo said. â€œLocal people have not lost anything through Kariba REDD+, instead they are paid to save their own treesâ€. Ndondo said there were many projects to be done through the Kariba REDD+, but â€œwe have little moneyâ€. Â This story was written under the aegis of the CSE Media Fellowship Programme. What will the inauguration of President Trump bring to Africa?